These Clip Picture Frames can be Used on a Desk or Mounted on a Wall! Multiple Sizes of Frameless Photo Holders are Available! Clip Picture Frames are Reasonably Priced! 1/8" Tempered glass panel & 1/8" chipboard back are secured in place with spring steel clips. 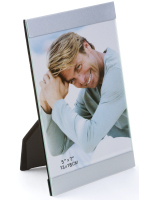 Affordable frameless portrait displays have a contemporary style. These clip picture frames are great for home or business. 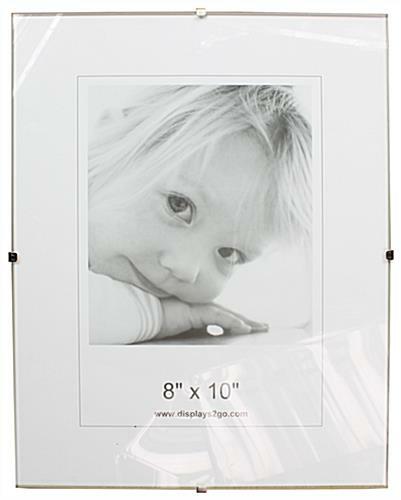 This photo holder can showcase family portraits as well as ads in a store. Clip picture frames are great gifts or favors. Each photo holder can display a single 7-7/8" x 9-7/8" image. These photo displays are clip picture frames for use on a wall or desk. 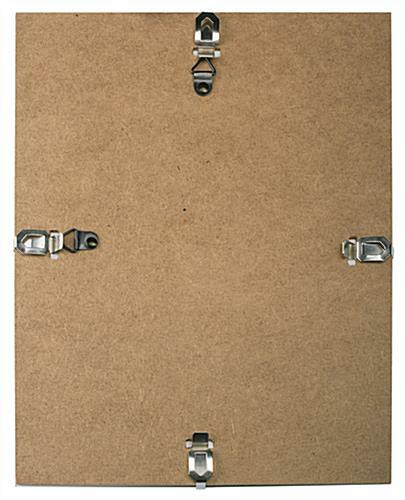 The chipboard back features an easel as well as a hanging hook. The hook on these clip picture frames is for vertical orientation only, however users can use the spring clips for horizontal format. 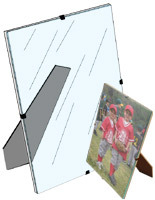 The easel is 2-sided for displaying in either portrait or landscape orientation. 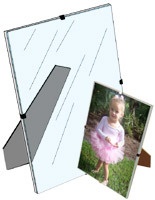 Exhibit professional photos, snap shots, advertisements, or a child's art in these glass poster holders. 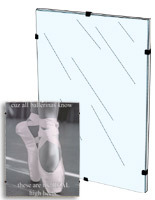 These tempered glass photo holders are clip picture frames that are for 7-7/8" x 9-7/8" photos. The hanger itself is 8" x 10" , so they are a great size for desks, mantels, or counters. These art holders with a glass panel are clip picture frames that are reasonably priced. 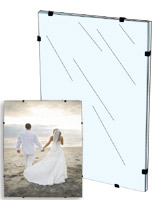 These frameless photo displays have a bulk quantity discount. 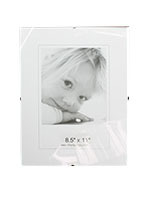 These clip picture frames are frameless to keep the photos the focal point. This glass print holder has (4) steel clips around the edges to hold the whole display together. These clip picture frames, called frameless holders for kid's art, have a tempered glass panel, which is safer and stronger than traditional glass. This art holder will never go out of style like many of the wood, metal, and plastic image displays on the market. 8.1" x 10.0" x 0.25"